Ahoy there shipmates! 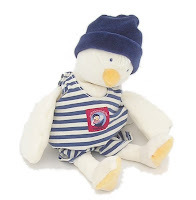 We would like to introduce Moulin Roty's new nautical themed range of toys and accessories which is available exclusively through Cottontails in the UK. (We're so chuffed!!) 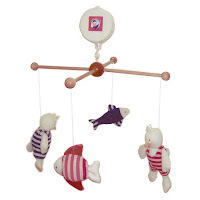 In smart navy and red colours, this is a particularly classic range of toys from the French designer, and is perfect for any little boys (or girls!) with an interest in the seaside. 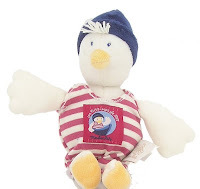 The range is based around a little seabird character who doesn't really have a name, so we have called him the Petit Sailor, which we think seems to suit him quite well. 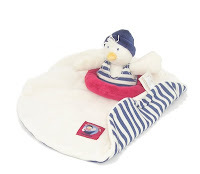 Items include a classic 30cm soft toy, two cuddly rattles, a comforter and various nursery accessories including a lovely musical mobile. 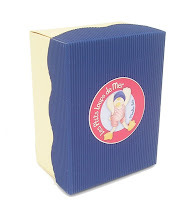 All the soft toys come in their own nautical style gift box, and the range is very reasonably priced with gift boxed rattles from just £10. how nice to hear from you - love the top one, gorgeous! !